Since I’m so intimately acquainted with the past releases of DC at this point, it’s always extremely exciting when I find a collected edition I hadn’t known about. 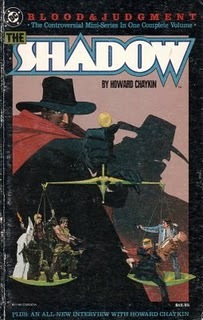 Today I came across The Shadow: Blood and Judgment when researching a misprint on my Doc Savage: The Silver Pyramid volume (I made a comment about it on the book, and there’s also a discussion thread on CBR if you wanna chat about your experiences with misprints.). I’ll be adding that one into the database and the reading order soon. I’ve also got a few more titles in my “add to database” to do list – ranging from the Batman Manga style releases to Sgt. Rock’s digest release. I feel like I’m really scraping the edge now – it’s pretty amazing. So many of the tiles that I’ve found recently don’t seem to be listed anywhere except for the odd spot to buy them from. It’s like finding treasure when I find an unknown book with the DC Bullet on it. I know exactly what you mean, I’ve had the same experience a number of times while working on my Marvel timeline. I think it’s especially exciting to discover a “new” trade that was actually published in the early or mid-’90s. For whatever reason, it’s just sort of cool to know that someone somewhere cared enough about a particular storyline to make sure that it got collected in a format different from the original single issues. What’s interesting about that one is the binding makes no mention of “DC” or “comics” or anything, just the editor’s last name and “America At War” on a plain white binding. When I get around to reviewing it, I’ll write more about it. Very cool book. looks pretty sweet. I’ll have to grab it if I see it – I’ve got too many ebay saved searches already, though haha. I recently was given a huge pile of 80s/90s comics that must have belonged to a speculation buyer. There are 2-6 copies of almost every one, and most of them look terrible. They’re all boarded, etc. A ton of Harbringer and H.A.R.D Corps. Some of what looks like a Marvel Sandman/Constantine rip off “Hellstrom” and a bunch of other stuff. Probably the BEST stuff in the pile is a couple issues of Hardware. It’s like the guy just bought everything that had the word “Hard” or “Hell” somewhere in the title. Very weird. I’ll probably give them away through this site. I’ve never read the ’90s Hellstrom series, but from what I’ve heard it might actually be okay…a lot of it was written by Warren Ellis. Also, Hellstorm = Daimon Hellstrom = the Son of Satan, a character who was featured in Essential Ghost Rider Vol. 1 and Essential Marvel Horror Vol. 1 (I guess Marvel didn’t want to put the words “Son of Satan” on a non-mature-readers trade?). I’ve read his appearances in Essential Ghost Rider and the character is actually kind of interesting, or at least he was in the ’70s. I bet the warren ellis issues were better, but the one issue I read had art direction like sandman and read like hellblazer but with a lot more terrible inner dialogue. I say like sandman, but it was more… I don’t know, the aesthetic without the passion.